Recently, I got an email from someone asking for recommendations of Caribbean young adult books in the fantasy genre. It made me realize that I haven't really read much in that area. Last year I started Caribbean Juvenile Literature Reading Challenge to motivate myself to read more Caribbean children's and young adult novels in general. I got about halfway through before my schedule distracted me from reading, but I still plan to complete that challenge one way or the other. Now I'm starting Caribbean Young Adult Sci-Fi and Fantasy Reading Challenge to motivate myself and others to explore books in this sub-genre. This time, I'm giving readers more time to complete the Challenge and inviting participants to start the Challenge whenever they want. 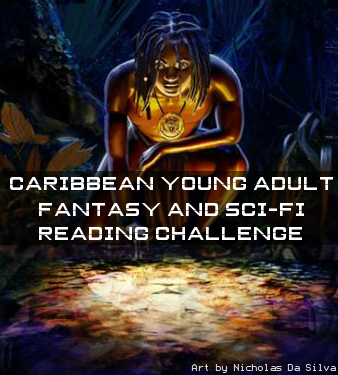 Read 12 Caribbean YA fantasy and science fiction novels in 12 months. Clicking on the book covers will take you to the book's page on Amazon. Note. The Island in the Sky by Tobias S. Buckell and The Jumbie Seed by Tracey Baptiste are forthcoming novels but I'm including them now in anticipation of their release. 1. Read the books on the list above. Don't worry if you aren't able to read all 12, just read as many as you can. 2. Sign up for the Challenge using Mr Linky below if you’re a blogger, and if you’re not a blogger simply leave a comment on this post so I can know who's reading along with me. This way, everyone can visit participants' blogs and check out any reviews or blog posts related to this Challenge. Which brings me to the next guideline. 3. Blog about the books that you read. You don't have to do long, detailed book reviews or anything, just say what you thought of the book and mention that you read the book as part of this Challenge. Please include a link back to this sign-up post so others can join the Challenge too. I'll also be blogging about the books as I read them. 4. You don't have to read the Challenge books in the same order that I'm reading them and you can read at your own pace. Also, you can start the Challenge whenever you want. That said, for the sake of discussion, some synchronicity would be nice! Note: You do not have to be a book blogger to participate. You can track your progress on Goodreads, LibraryThing, Shelfari etc. Below, please enter the direct link to your reviews/posts about this Challenge, not to the main page of your blog. We'd like to be able to find your review directly through the link and not have to look for it. Thanks for participating! I heard news that my former grad school advisor and professor at UPenn, the late Dr. Lawrence Sipe's amazing children's book collection has found a home at the International Youth Library in Munich, Germany. Dr. Sipe passed away suddenly in my final year of grad school and I've always wondered what would become of the hundreds of children's and young adult books that lined the shelves of his almost legendary office. 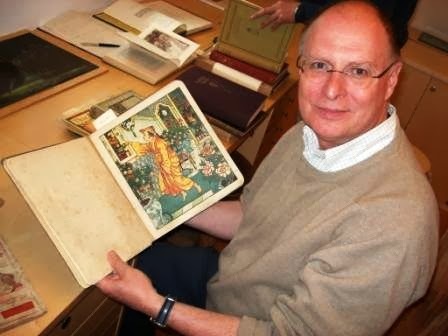 It turns out that the Children's Literature Assembly along with the United States Board on Books for Young People (USBBY) and Dr. Sipe's heirs raised funds to cover the costs of sending the approximately 4,200 volumes from Philadelphia to the IYL in Munich where they will remain and be known as the Lawrence R. Sipe Collection. What a great legacy to leave behind! So many children, children's literature scholars and researchers pass through the doors of the IYL, the largest library for international children's and youth literature in the world. 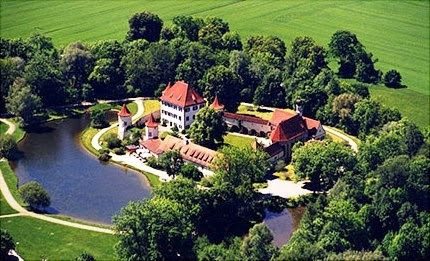 I hope I will be fortunate enough to visit the collection there one day myself. Dr. Sipe always spoke highly of the International Youth Library. Hearing this news of the collection, I couldn't help reminisce on the hours I spent as Dr. Sipe's graduate assistant restocking the books on his office shelves and discussing children's literature with him. My time with that wonderful collection of books was such a valuable professional development experience, I would even say pivotal. And I know so many of his students and colleagues at UPenn enjoyed his books. I still feel sad whenever I think about Dr. Sipe's passing, but wherever he is, I trust he is smiling knowing his beloved books have found a safe home where they will be put to good use. Dr. Sipe at the International Youth Library a few years ago. Gone but not forgotten!